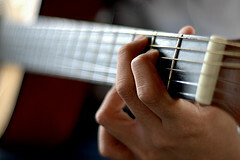 Guitar Chords - A Hard Time Getting Your Fingers In The Right Position? Do you have a hard time getting your fingers in the right position when making guitar chords? If you do then don't despair, it doesn't mean you're no good at guitar. Many of us have trouble with chord fingerings from time to time, here's a list of common reasons for this problem and some solutions for each. Let's take a look at each of these problems in turn and identify some potential solutions you could apply for each of them. You could experience this problem because your mind isn't really clear where your fingers should be and how they get there. The solution for this problem is to fix all the details of the chord position in your mind. Study each finger's place, what string and what fret it goes on, and how it gets there. Create a vivid picture in your mind exactly where all the fingers go and how they get there for each chord. You might know the chord position, but that isn't enough for your fingers to play it. You'll need to train them to perform the desired movements fluently. If this is your problem then you probably need a combination a good training system and more time to develop your finger skills. A good place to look for more information on finger training for the guitar is the Guitar Principles book from Jamie Andreas. You might know the chord and even be able to play it, but you can get into trouble if you don't anticipate changes and prepare for them ahead of time. A hurried chord change makes it harder to get your fingers into position. You must know exactly where you are and what's coming next as you play. Counting beats and bars is one way to do this but it's quite easy to get lost. An easier and more reliable solution is to learn to sing the words and recognize where the chord changes occur relative to them. You might know that the chord change is coming, but if it's a chord that you have trouble with the chances are you tense up in anticipation of all the bad things that could happen. Learn to spot tensions and consciously release them as you practice, ask what parts of your body have tension when you play the chord change? It can also help to let go of perfectionist desires - if you attach too much importance to perfect chord changes you'll cause more harmful tension. The chord you're trying might simply be too difficult for you right now. Your fingers need time to develop the strength, agility and stretch some chord positions require. If you've tried the previous solutions already and still can't make the chord then you should probably put it aside for a while until your fingers are more developed. Don't force things, you could injure yourself or end up bored and frustrated because songs take too long to learn. Find some easier songs more or look for an easier way to play the song you're trying. Remember, chords can often be simplified. Let's summarize the problems and solutions we've reviewed now. Now you have solutions to five common problems that can give you a hard time getting fingers in right position when making chords. Remember to apply them during your guitar practice sessions.